This post is sponsored by BOOMCHICKAPOP. A big bowl of Easy Buffalo Ranch Popcorn Mix is the ultimate light treat to bring the BOOM to your game day tailgating or party! It's super easy to mix up and booming with buffalo ranch flavor! When it comes time to planning your game day menu, it's almost mandatory to include a buffalo-something in your spread. While the first thing you might think of is wings, I'm here to let you know that the first thing that comes to mind isn't always what's best. See that popcorn mix? That's the something buffalo that you should be serving during the big game. Buffalo. Ranch. Popcorn. Mix. My run down of mix-ins for this big bowl of delish goodness starts, of course, with the fabulous Angie's BOOMCHICKAPOP Sea Salt Popcorn. It's as much fun to eat as it is to say. Go ahead try it, I'll wait. See? Good stuff. BOOMCHICKAPOP is great tasting, fun, and keeps it simple. I chose some crackers, nuts, and pretzels as my party popcorn companions. Feel free to switch up the mix-ins to suit your tastes! Just be sure that what you put in there goes with buffalo flavors, because that's what comes next. A nice light drizzle of buffalo sauce followed by a light sprinkling of ranch seasoning brings this popcorn mix just the right amount of zest. 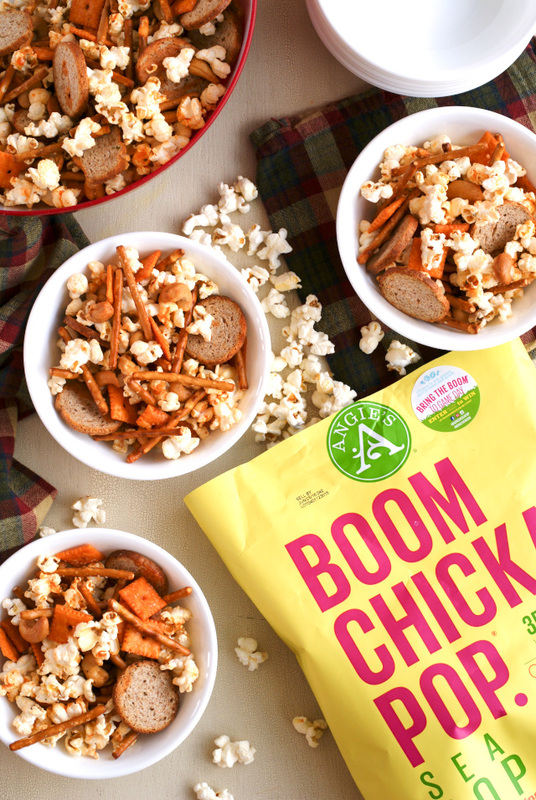 Whether you’re hosting a huge party to cheer on your favorite football team or rooting for your local basketball team with friends, this tasty BOOM snack mix will keep everyone satisfied! Not into sports? Think game night with friends or family movie night! The point is, I highly recommend you make it! This popcorn mix is totally going to be the star of your spread, but that's not even the best part. If you snap a pic of you and your crew bringing the BOOM on game day, you can win one of five Game Day Kits! Contest ends on February 10th, so don't forget to snap your #BringTheBoom moments on game day this weekend! 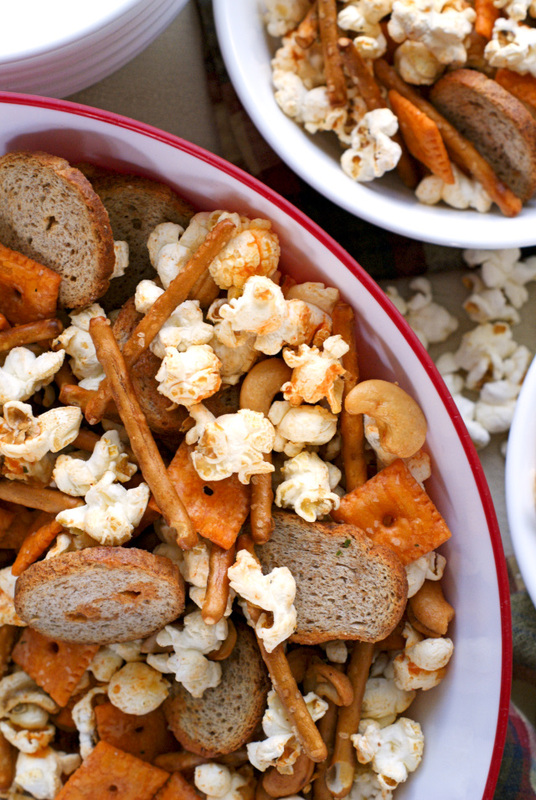 And enjoy munching on this zesty, bold buffalo ranch snack mix while you're at it! Spread the popcorn and mix-ins onto a large platter or cookie sheet. Stir together the melted butter and hot pepper sauce. Drizzle over popcorn and mix-ins. Sprinkle with ranch mix. Toss everything a few times and transfer to a bowl. Dig in! This post is sponsored by BOOMCHICKAPOP. All thoughts and opinions are, as always, 100% my own. 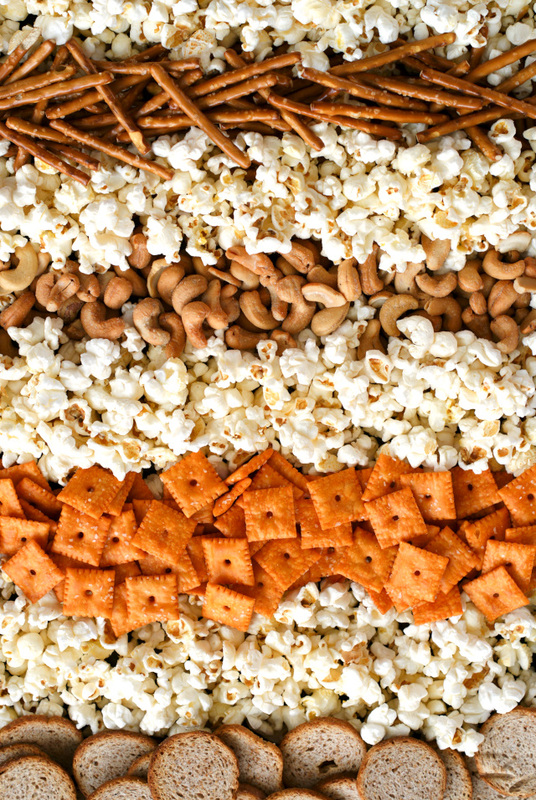 This looks like the perfect snack mix! We love Boomchickapop!